Not to be confused with Boston Latin Academy. The Boston Latin School is a public "exam school" in Boston, Massachusetts. Established on April 23, 1635, it is arguably either the oldest or second oldest school as well as the first public school in the United States. 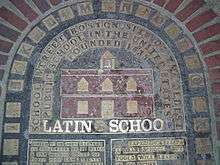 The Public Latin School was a bastion for educating the sons of the Boston "Brahmin" elite, resulting in the School claiming many prominent Bostonians, Massachusetts citizens and New Englanders as alumni. Its curriculum follows that of the 18th century Latin-school movement, which holds the "classics" to be the basis of an educated mind. Four years of Latin are mandatory for all pupils who enter the School in the 7th grade, three years for those who enter in the 9th. In 2007, the School was named one of the top twenty high schools in the United States by U.S. News & World Report magazine. The School was named a 2011 "Blue Ribbon School of Excellence", the U.S. Department of Education's highest award. As of 2016, the School is listed under the "gold medal" list, ranking 51 out of the top 100 high schools in the United States (more than 20,000 public high schools from 50 states and the District of Columbia were analyzed) by U.S. News & World Report magazine. Plaque on School Street commemorating the site of the first Boston Latin School building. 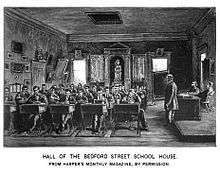 Hall of the BLS School House on Bedford Street, 1844–1881. Puritans placed a strong emphasis on education at every age level for their offspring, beginning at home, with a primary reason for this being in order to read the Bible, which was used for spiritual and moral instruction. Puritan leaders themselves were accustomed to the highest educational standards, with most of their ministers having graduated from Oxford or Cambridge University in England. They soon established Boston Latin School as the first school in the colony, and modeled it after the European Latin School Model, which emphasized the learning of religion, Latin, and classical literature. In early years they were not funded by tax dollars, but rather by donations and land rentals. A school established in nearby Dedham thus became the first tax supported public school several years later. English was not the dominant language of the world at that time, and the ability to read and speak more than one language was considered important for those who would excel. Therefore the learning of Latin (considered to be the mother of European language) was also a priority, as it was with grammar schools in England. Seventeenth-century schoolboys throughout Europe, Catholic or Protestant, learned Latin, and which explains the "Latin" in "Boston Latin." The ability to read at least Cicero and Virgil was a requirement of all colonial colleges, and to write and speak such Latin in verse and prose was the first of the Harvard laws of 1642 (followed by Christian conversion). Boston Latin prepared many students for admission to Harvard, with a total of seven years (on long wooden benches) being devoted to the classics, and providing almost one seventh (29) of Harvard members during just one period (1771 through 1774). However, most graduates of Boston Latin did not go on to college since business and professions did not require collegiate training, which more basic learning provided for. The School's first class was in single figures, but it now has 2,400 pupils drawn from all parts of the City of Boston and some additional tuition-paying students throughout the metro area. It has produced four Harvard presidents, four Massachusetts governors, and five signers of the United States Declaration of Independence. Benjamin Franklin and Louis Farrakhan are among its well-known dropouts. The School originally began as the South Grammar School, and was specifically modeled after the Boston Grammar School in Lincolnshire, England, from where many of Boston's original settlers derived. Current students assert with pride that Harvard College, founded a year later in 1636, was created for Boston Latin's first graduates to attend and continue their education. Whether or not that is true, Boston Latin has been a top feeder school for Harvard, and has consistently sent large numbers of its graduates to Harvard, recently averaging about twenty-five students per year. More than 99% of Boston Latin's approximately 400 annual graduates are accepted by at least one four-year college. The Latin School admitted only male students and hired only male teachers from its founding in 1635. The School's first female student was not until the 19th century, with Helen Magill White as the school's first female graduate and first American woman to earn a doctorate. However, soon after White's graduation in 1877, the Girls' Latin School (later the co-ed Boston Latin Academy), was founded. For nearly a century, all qualified female students would attend that all-girls institution. It was not until 1972 that Boston Latin would admit its first co-educational class. Female teachers predated female students at Boston Latin. In 1967 the school appointed Marie Frisardi Cleary and Juanita Ponte as the first two women in its academic faculty. Cornelia Kelley, the school's first female headmaster, served from 1998 until her retirement in 2007, after which Lynne Mooney Teta was selected to become the school's 28th headmaster. Mooney Teta is a 1986 graduate of Boston Latin and was formerly an assistant headmaster at the school. Under Teta, Boston Latin School removed all honor classes within its curriculum. However, there is an option to take accelerated courses of Algebra 2; Geometry; Pre-Calculus; and Latin 4 that do not give the 1.0 GPA boost. In January 2016, the school became the center of a race-related controversy started by the student group BLS B.L.A.C.K. (Black Leaders Aspiring for Change and Knowledge) using the hashtag 'BlackAtBLS' on Twitter. The hashtag encouraged students of color to share their personal experiences of racism at the school. Several local and national media outlets picked up on the hashtag and acute attention was drawn to the issues of racial inequities, racism, and faculty negligence over race-related disciplinary issues at the school. BLS B.L.A.C.K. 's list of demands included faculty diversity trainings, workshops, and meetings with the Headmaster on a regular basis to discuss racialized issues in the school, demands which were accepted by Headmaster Teta. Boston Latin's motto is Sumus Primi, Latin for we are first. This is a double entendre, referring both to the school's date of founding and its academic stature. Boston Latin has a history of pursuing the same standards as elite New England prep schools while adopting the egalitarian attitude of a public school. Academically, the school regularly outperforms public schools in rich Boston suburbs, particularly as measured by the yearly MCAS assessment required of all Massachusetts public schools. In 2006, Brooklyn Latin School was founded in New York City, explicitly modeled on Boston Latin, borrowing much from its traditions and curriculum. Admission is determined by a combination of a student's score on the Independent School Entrance Examination (ISEE) and recent grades, and is limited to residents of the city of Boston. Although Boston Latin runs from the 7th through the 12th grade, it only admits students into the 7th and 9th grades. Consequently, the higher grades have fewer students than the lower grades, as a relatively large number of students transfer out. The school has historically been described as having a sink-or-swim environment, but in recent years there have been notable efforts to create a more supportive atmosphere. Because it is a high-performing and well-regarded school, Boston Latin has been at the center of controversy concerning its admissions process. Admissions are very competitive, and it is not uncommon for fewer than 20% of applicants to be admitted. Before the 1997 school year, Boston Latin set aside a 35% quota of places in its incoming class for under-represented minorities. The school was forced to drop this policy after a series of lawsuits involving non-minority girls who were not admitted despite ranking higher than admitted minorities. Boston Latin subsequently defeated a legal effort to do away with its admissions process entirely and conduct admissions by blind lottery. Since 1997, the percentage of under-represented minorities at Boston Latin has fallen from 35% to under 19% in 2005, despite efforts by Boston Latin, the Boston Public Schools, and the Boston Latin School Association to recruit more minority applicants and retain more minority students. Some advocate instituting a quota for the number of students that must be admitted from Boston's public middle schools. Declamation is the most time-honored of the school's traditions. Pupils in the 7th to 10th grade are required to give an oration, known as 'Declamation', in their English class three times during the year. There is also Public Declamation, where pupils from all grades, or classes, are welcomed to try out for the chance to declaim a memorized piece in front of an assembly. During Public Declamation, declaimers are scored on aspects such as "Memorization" "Presentation", and "Voice and Delivery", and those who score well in three of the first four public declamations are given the chance to declaim in front of alumni judges for awards in "Prize Declamation". In addition to the well-known and time-honored tradition of declamation in English classes, recently the Modern Languages department instituted an annual "World Language Declamation" competition. Once a year, during National Foreign Language Week (usually the first week of March), students from grades 8 through 12 perform orations in languages other than English. Most students choose to declaim in the modern language they are studying, though some choose Latin, Greek, or their native tongue. Judges are brought in from various institutions around the city, and mark the students in similar categories to those used in Public Declamation. Entrants are categorized by level, rather than language, such that all students declaiming at the first-year level of various languages are competing against each other, all students at the second-year level compete against each other, and so on. Students who regularly perform exceptionally well at World Language Declamation are honored at Prize Night with the Celia Gordon Malkiel Prize. In a move that was controversial among some alumni, the school decided in 2001 to decrease the requirement for students' Latin instruction by one year, starting with the class of 2006. The mandatory minimum period of Latin instruction was decreased for students admitted for 7th grade from five years to four years, and for students admitted for 9th grade from four years to three years. This decision was made by the head of the school's Latin department, in recognition of the fact that the requirement was hampering students' ability to take enough courses in important modern subjects such as Physics, Chemistry, Computer Science and modern languages. However, students can still take Latin courses after their fourth year, in AP Latin and Latin 5, the latter if there is demand. Greek is additionally an option. In a 1789 codicil to his will, Benjamin Franklin established a legacy to fund the Franklin Medals, which are awarded to the school's top-ranking pupils at graduation. The second most prestigious awards, the Dixwell Prizes, are given to pupils excelling in Latin or Greek. There are currently two main publications of the Boston Latin School: The Register is the school's literary magazine, and The Argo the school newspaper. George Santayana founded The Register in 1881 to serve as the school newspaper. Over the years, however, it evolved into a purely literary magazine, publishing prose and poetry written by members of the student body, as well as artwork. There are generally two editors-in-chief, and it is published twice per year. The Argo, the school's newspaper, is far younger, having been founded after it was clear that the Register had become a purely literary magazine. As of the 2006–2007 school year, it is published seven times a year. Both the Register and the Argo are entirely student-produced, and both have won awards from the New England Scholastic Press Association. The Catapulta is the science publication, and has also received several awards. Another Boston Latin publication is "BLSA Bulletin," published by the Boston Latin School Association, whose president is Peter G. Kelly, '83. Boston Latin's teams are known as the Boston Latin Wolfpack; their colors are purple and white. Boston Latin has played rival Boston English in football every Thanksgiving since 1887, the oldest continuous high school rivalry in the United States. Boston Latin has several teams that tend to be competitive and successful such as the sailing team, girls volleyball team, the girls crew team, baseball, softball, wrestling, boys soccer, boys hockey and cheerleading. In the spring of 2015 Boston Latin launched its varsity boys lacrosse as well as varsity girls lacrosse which makes it the only public school in Boston with lacrosse. In the fall of 2016 the schools Varsity Cheer team took home the DCL title for the 3rd time in program history and 2nd in a row. Moreover the JV team competed at the DCL competition for the first time and also took first! In "Six Meetings Before Lunch", a first-season episode of The West Wing, Rob Lowe's character, Sam Seaborn mentioned Boston Latin School in a discussion of public school reform and school vouchers in American public education. He said, “Boston Latin, the oldest public school in America, is still the best secondary school in New England.” Mallory O'Brien replies "They all can't be Boston Latin and Bronx Science". On January 8, 2002, President George W. Bush visited the Boston Latin School after signing the No Child Left Behind Act earlier that day. In Season 1, Episode 12 of Studio 60 on the Sunset Strip, Matthew Perry's character Matt Albie mentioned that his nephew had a 3.8 GPA at Boston Latin. In the 2008–2009 school year, former vice president Al Gore visited Boston Latin School and commended the students for their hard work educating the community about making environmentally respectable decisions. Boston Latin has graduated notable Americans in the fields of politics (both local and national), religion, science, journalism, philosophy, and music. Of the 56 men who signed the Declaration of Independence, five were educated at Latin: Adams, Franklin, Hancock, Hooper, and Paine. Graduates and students fought in the Revolutionary War, American Civil War, World War I, World War II, Korean Conflict, and the Vietnam War, and plaques and statues in the school building honor those who died. The Hall of Fame, known casually as "The Wall," refers to the upper frieze in the school's auditorium, where the last names of famous alumni are painted. These names include Adams, Bernstein, Fitzgerald, Franklin, Hancock, Hooper, Kennedy, Mather, Paine, Quincy, Santayana, Winthrop, and many others. The most recent name, Wade H. McCree Jr., was added to the frieze in 1999, and the selection of the name involved a conscious effort to choose a graduate of color. There are no names of female graduates, mostly because females have attended the school for just 34 years and the honor is only bestowed posthumously. There is also a lower frieze with the names of many other distinguished graduates, and a place on the lower frieze can be awarded while the person is still alive. ↑ Caldwell, Dave (2006-11-10). "Thanksgiving Day Games: Old Rivalries, Then the Turkey". New York Times. Retrieved 2008-01-12. ↑ "History of Boston Latin School—oldest public school in America". BLS Web Site. Archived from the original on 2007-05-02. Retrieved 2007-06-01. ↑ "Boston Latin School". Encyclopædia Britannica Online. ↑ "First Public School Site and Ben Franklin Statue". City of Boston web site. ↑ "Boston Latin School". NNDB. ↑ "Best High Schools 2008". U.S. News & World Report. November 29, 2007. ↑ "The First-Class State—Two examples of how Massachusetts gets it right". U.S. News & World Report. November 29, 2007. ↑ "National Rankings Best High Schools". U.S. News & World Report LP. 2016-04-19. Retrieved 2016-04-20. ↑ Jeynes, William H. (2007). American educational history : school, society, and the common good. Thousand Oaks, Calif. [u.a. ]: SAGE Publications. pp. 4, 6, 12. ISBN 978-1412914215. Retrieved 6 March 2016. ↑ Simon, Christopher A. (2001). To run a school : administrative organization and learning. Westport, Conn.: Praeger. p. 8. ISBN 978-0275968342. 1 2 Sacchetti, Maria (November 27, 2005). "Schools vie for honor of being the oldest". The Boston Globe. Retrieved June 14, 2016. "In Boston everybody may have agreed that education was important, but nobody put his wallet on the table," said Robert Hanson, Dedham's former executive secretary and the unofficial historian. ↑ Howe, Françoise Waquet. Translated by John (2002). Latin or the empire of a sign : from the sixteenth to the twentieth centuries (Paperback ed. 1. publ. by Verso. ed.). London: Verso. p. 22. ISBN 978-1859844021. Retrieved 6 March 2016. ↑ "History of Harvard". AllAboutHistory.org. Archived from the original on 16 March 2016. Retrieved 6 March 2016. ↑ Morison, Samuel Eliot (1968). The founding of the Harvard College. Cambridge, Mass. : Harvard University Press. p. 333. ISBN 978-0674314504. Retrieved 6 March 2016. ↑ Meckler, ed. by Michael (2006). Classical antiquity and the politics of America : from George Washington to George W. Bush. Waco, Tex. : Baylor Univ. Press. p. 18. ISBN 978-1932792324. Retrieved 6 March 2016. ↑ Wright, Conrad Edick (2005). Revolutionary generation : Harvard men and the consequences of independence. Amherst [u.a. ]: Univ. of Massachusetts Press. p. 26. ISBN 978-1558494848. Retrieved 7 March 2016. ↑ Reese, William J. (1999). The origins of the American high school. New Haven: Yale University Press. p. 3. ISBN 978-0300079432. ↑ "Benjamin Franklin". Exodus Provisions. ↑ John B. Judis (August 18, 1996). "Maximum Leader". The New York Times. Retrieved 2006-05-19. ↑ Publications of the Colonial Society of Massachusetts, Volume 27. Colonial Society of Massachusetts. 1932. p. 135. Retrieved 11 March 2016. ↑ Marie Frisardi Cleary (May 19, 1985). "The Halls of Boston Latin School". New York Times. Letter to the editor. ↑ Bergeron, Amanda (July 21, 2007). "Juanita Ponte, 62; taught at Boston Latin". Boston Globe. Retrieved 2007-07-21. ↑ Jan, Tracy (2007-02-14). "Boston Latin headmaster to retire". Boston Globe. Retrieved 2007-12-31. ↑ "Assistant head is named to Latin's top job". Boston Globe. June 26, 2007. Retrieved 2007-07-04. ↑ Catalogue of the Boston Public Latin School, Established in 1635: With an Historical Sketch, Henry Fitch Jenks. Boston Latin School Association. 1886. Pages 94–95. ↑ Catalogue of the Boston Public Latin School, Established in 1635: With an Historical Sketch, Henry Fitch Jenks. Boston Latin School Association. 1886. Page 303. ↑ Jan, Tracy (March 4, 2006). "Growing a Boston Latin in Brooklyn". Boston Globe. Retrieved 2007-08-31. ↑ "Answers to Frequently Asked Questions about Entrance to Boston Latin School" (PDF). Archived from the original (PDF) on 2008-02-29. Retrieved 2007-12-31. ↑ See: Wessmann v. Gittens, 160 F. 3d 790 – Court of Appeals, 1st Circuit 1998 s:SARAH P. WESSMANN, p.p.a. HENRY ROBERT WESSMANN, v. ROBERT P. GITTENS, CHAIRPERSON OF THE BOSTON SCHOOL COMMITTEE, ET AL., and McLAUGHLIN BY McLAUGHLIN v. Boston School Committee, 938 F. Supp. 938 F.Supp. 1001 (1996) Civil Action No. 95-11803-WAG. United States District Court, D. Massachusetts. s:938 F.Supp. 1001 (1996) Julia A. McLAUGHLIN, by Catherine McLAUGHLIN, Plaintiff, v. BOSTON SCHOOL COMMITTEE, et al., Defendants. ↑ "The Boston Latin Case". Center for the Study of Testing, Evaluation, and Educational Policy. Archived from the original on 2007-08-08. Retrieved 2008-01-29. ↑ Vaishnav, Anand (2001-04-13). "Boston Latin Eases Language Requirement". Boston Globe. Archived from the original on April 16, 2001. Retrieved 2007-12-31. ↑ "Publications—Argo". BLS Web Site. Archived from the original on 2007-09-27. Retrieved 2007-06-01. Includes scans of first Argo edition, 1969. ↑ Werchadlo, Emily (2005-11-24). "It's still defined by Latin and English". Boston Globe. Retrieved 2008-01-29. ↑ Dahlbeck, Dwayne (2007-11-27). "Latin's first conquest comes at last". Boston Globe. Retrieved 2008-01-29. ↑ "President Bush Speaks in Boston". CNN.com. 2002-01-08. ↑ Rauseo-Ricupero, Ronaldo (2002-01-09). "Bush Comes To Boston After Education Victory". Harvard Crimson. Retrieved 2007-12-31. Wikimedia Commons has media related to Boston Latin School.